Tour Description: Beijing airport pick-up by our English-speaking tour guide who will hold a sign with your name on at the arrival hall meeting point. 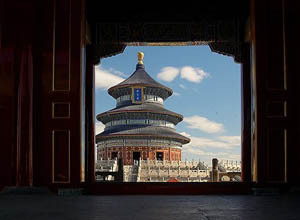 First, drive to the Temple of Heaven, an impressive large-scale architecture, where the Chinese emperors held grand sacrifice ceremonies to worship heaven. After that, transfer to the Hutong area where you can see the real life of Beijing ordinaries, pay a visit to local Hutong family. An interesting rickshaw trip is arranged in the Hutong alleys. Besides, tour in Drum Tower and Yandaixiejie Street are also included. Return airport after the tour. End of our service. Hello. We will be in Beijing tomorrow. Is it possible to book this trip on late notice? Hopefully you are able to reply in an hour or so before we take off from Stockholm today. (we have Visas for China already but were delayed and missed our intended tour). Please let me know how much and how I can book (Especially if we take off before you are able to reply. Could you include a local phone number and the best advice for how we could proceed in that case. We can arrange this tour for you. We sent an email to you, please have a look.